When gardeners talk about annuals, biennials and perennials, they are referring to the lifespan of the plant. Annuals, as the name implies, live through one growing season before they go to seed at the end of their life cycle. Biennials, also as the name indicates, mature and go to seed in two growing seasons. Perennials are plants that live longer than two growing seasons as long as they are grown in conditions that meet their needs. This includes ornamental grasses, flowering plants, trees, shrubs, food plants, and tropical plants. It should be noted that some annuals can be grown as perennials in coastal Southern California’s mild climate, such as lantana, which is grown as an annual in other parts of the country but thrives as a perennial here. Also, some tender perennials, such as tomatoes, are generally grown as annuals, even in Southern California. Why Should I Plant Perennials? 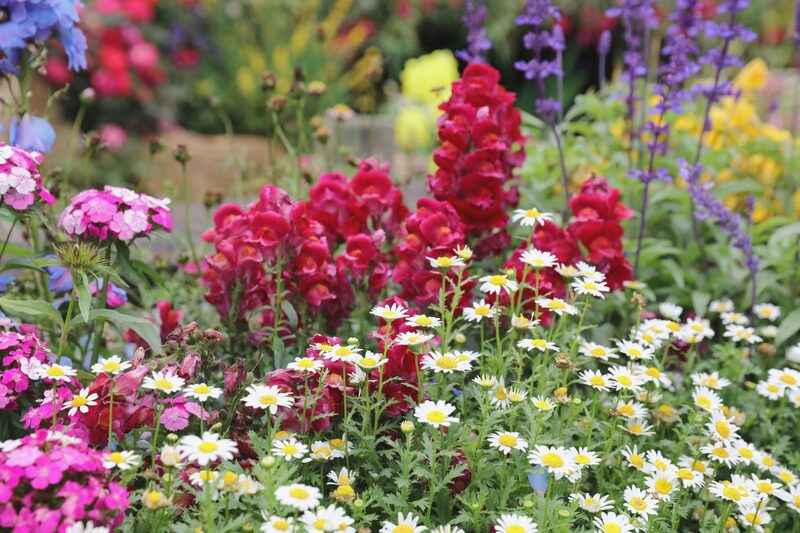 Some gardeners prefer fast-growing, colorful annuals to fill their garden beds each year. This allows you to enjoy a fuller, more colorful garden faster, but it also requires you to replant your entire beds every year. If your goal is to keep blooms in your garden year round, this also means planting new annuals throughout the year. It is generally better for most gardeners to plan a longer-term garden design that centers around perennials while also including annuals to quickly fill in gaps and to add splashes of color. While some perennials die back each year, their roots are still alive in the soil, and they will come back year after year to provide a consistent, long-lived garden that does not require you to redesign the entirety of your flowerbeds annually. Plus, there are many perennials that retain their foliage year-round, particularly in climates like the one we enjoy in coastal California. This allows you to enjoy various colors and textures in your garden at all times and is also makes these perennial plants a good choice for privacy screens and more-permanent borders. Both annuals and perennials require maintenance and some effort on your part. So, whether or not you should plant perennials depends on if you prefer replanting your flowerbeds every year or taking the time to maintain your perennials with tasks like cutting them back or dividing them in spring. The level of maintenance required will depend on the types of perennial plants you include in your landscape design. While it is generally considered best to plant perennials in the spring after the last frost or in the fall before the first frost, Southern California gardeners can really plant their perennials any time of year. If you are working with bareroot plants, it is best to plant them during the recommended spring and fall planting seasons to help ensure a successful planting and to give your perennials the best chance of thriving. Since bareroot plants need to be in the ground as quickly as possible after getting them home, you should purchase these plants in the spring or fall after you have prepared your garden beds for planting. Some perennials do best in partial shade, while others require full sun to thrive, so where you plant your perennial flowers will depend partly on which plants you purchase. It is always best to purchase your plants locally to help ensure that you are buying plants that will do well in your area. Most gardeners include other elements in their gardens, such as trees, shrubs or annuals, but perennials act as the backbone of your garden and the element that pulls everything together for a cohesive overall look. Most of your garden planning should focus on the perennials, and then you can incorporate other elements to complete the desired visual. If you are planting in borders, it may be of benefit to you to choose taller perennials that will be placed at the back of the flowerbeds and mid-height perennial flowers for the center of the beds so that the flowers you will be replacing every year (your colorful annuals) will be easy to access and plant in the front row of the border. If you are planting in an island garden bed and plan on using both perennials and annuals, consider planting the perennials towards the center of the island so that the area for the annuals will be more accessible around the outer edge. If you are planting perennial food plants, such as peppers or artichokes, in a vegetable garden, be sure to place them in a location where they can stay for at least a few years without overcrowding or blocking the sun from reaching other plants. Should I Plant Perennials from Seeds or Plants? Planting from seeds is less expensive and allows you to control the growing medium in which your plant starts are grown. If you live in an area that freezes, it can be helpful to start seeds indoors so that they will be ready to transplant into your garden after the last frost in spring. Alternatively, you can plant perennial seeds directly into the ground after the last frost, but you will have to wait longer to enjoy larger, more colorful plants. If you do not live in an area that freezes, you can start seeds directly in the ground pretty much any time of the year. It is important to note that perennials started from seed generally do not flower until the second growing season, so saving money by starting from seeds requires more patience. Starting from potted perennial plants purchased online or at a local nursery allows you to skip caring for plants as they germinate and mature into starts and move straight to transplanting them into your garden and enjoying larger plants with more color faster. 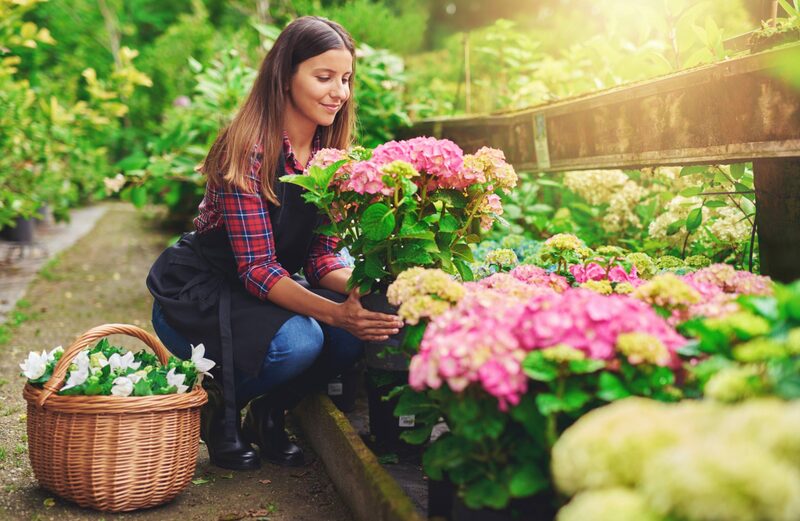 If you purchase your plant starts locally, you also know that your plants are already accustomed to living in your climate and that you are buying perennials that can thrive where you live. The first step in planting perennials is to determine your garden layout and come up with a plan for the plants you need to purchase. You do not want to create a hodgepodge look by picking up a few plants that appeal to you every time you go to Home Depot or Lowes for supplies for home improvement projects. Your perennials will be with you for years, so you need to purposefully select options that will do well where you live, that enhance the look of your yard and that can be incorporated into your overall garden design. If you know the types of plants you want to include, be sure to consider each plant’s spacing requirements as you design your landscaping. Also, remember to keep in mind each plant’s blooming season so that you can place them for continued color and visual interest throughout the year. Once you have your garden design, it is time to purchase the necessary plants and set them where they will go. Leave them in their pots for this and simply set the pot in the spot where you intend to grow each plant. This will allow you to confirm that each plant will work in its intended location and that your design looks as good in practice as it did in theory. The next step is to prepare your soil. Remember, these plants will likely be in this same spot for at least a few years, so you want to make sure they can get the nutrients and level of drainage they need from the soil. Different plant varieties have different requirements for sun exposure, soil pH, drainage, and optimal soil conditions, this is why you must first come up with your overall garden design and know which plants you intend to use. When it is time to move to the planting stage, dig holes that are a bit deeper than the pot that the plant is currently in and that are about twice the width of the pots. Mix in a bit of compost to further enrich the soil. Remove each plant from its current pot and gently break up the root ball a bit to help the system take root in the soil. Place your plant in the hole and fill the hole with soil around the plant. 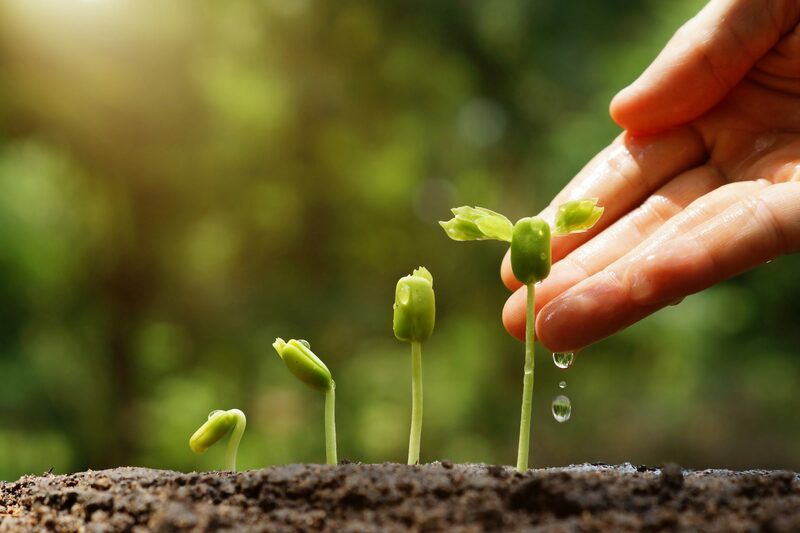 As with any transplanting, you will then want to give your perennial plants enough water to thoroughly moisten the soil around the root system. Plants require more water while they are becoming established, so it is a good idea to add a layer of mulch around your new perennials to help the soil retain moisture and to prevent the growth of weeds, which will compete for water and nutrients. 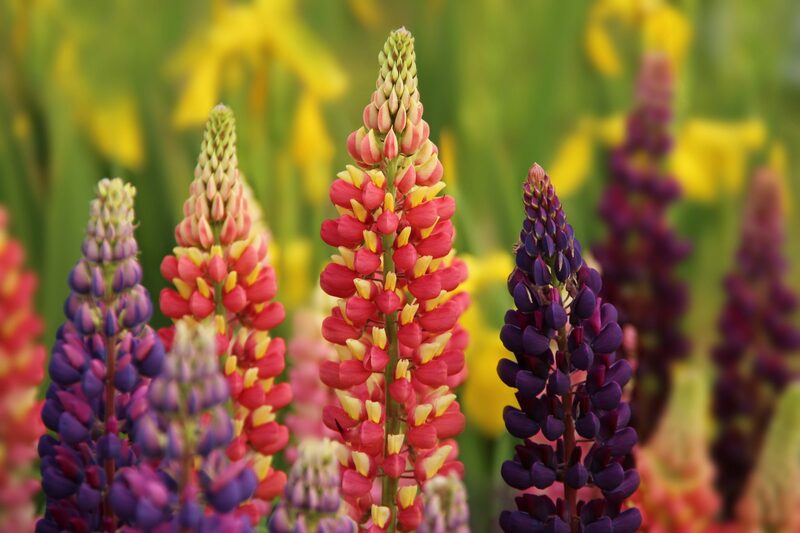 The maintenance of your perennials require will be specific to the plant varieties you choose for your garden. Some perennial flowers, grasses and plants require more maintenance than others, while some require hardly any maintenance at all. All of your flowerbeds will require regular weeding to ensure that weeds are not taking away from the look of your garden and competing with your desirable plants for sun, nutrients and water. During the first year, most perennials will require regular watering to keep the soil moist as they become established. Once they are established, you should be able to cut back to irrigating thoroughly once or twice per week. If you are on a once-per-week watering schedule, remember that you will need to water more often in the hotter months of summer. Perennial flowers will often bloom more than once if you regularly deadhead spent flowers. This also allows the plant to redirect its energy into the root system and foliage, rather than sending energy to flowers that are no longer attractive and into seed production. Further, deadheading prevents seed development and dispersal, which will help you maintain the look of your garden without the extra effort of removing new plants coming up in unexpected places. In most cases, you can simply pinch the spent blooms off of the plants to deadhead perennials. If you plan on fertilizing your plants, this is also a good time to apply fertilizer to help ensure continued growth and even more blooms in the next flowering season. If you have varieties that die back in winter, you will need to cut back your perennials to just a few inches above the ground. While this may not be attractive during the winter months, your plants will come back in spring. You will likely need to divide your perennials every few years. This allows you to prevent overcrowding in your flowerbeds and to discard any sections that are not performing well or that have root systems that have become woody. Dividing perennials also provide new plants for ongoing texture and color without trips to your local nursery. To divide your perennial plants you will need to gently dig up the entire plant with the root ball. You can then divide the root system into multiple plants by using a shovel, garden trowel or knife to cut the root ball into sections or by teasing the roots apart. Once you have your divided sections, plant them in the ground in the same manner in which you planted the original plant. Do not divide your perennials during their blooming season. The best time to divide perennial plants is in the spring before they bloom or in the fall after their flowers are spent. Some perennials are plagued by pests while others offer natural pest control and can even protect the plants around them from insect or molluscan invasions. You may find that you need to protect your plants from snails and slugs, which love to dine on many annuals and perennials. You will know that you likely have a snail problem if you are noticing significant foliage loss that seems to happen at night or if you see the tell-tale trails that snails and slugs leave behind. There are several natural ways you can protect your garden from snails and slugs, or you can purchase a commercial product that will keep them out of your garden or kill them if they dare to enter. For other pests, check out our guide to natural pest control to help protect your plants.